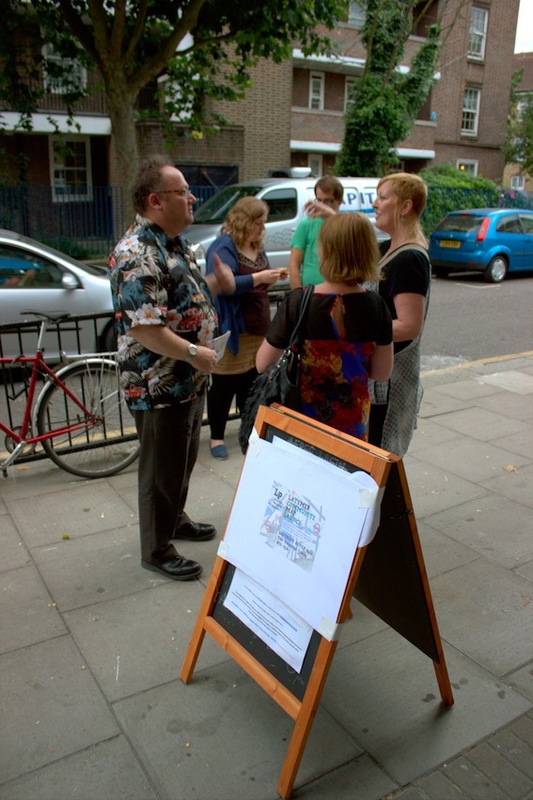 Join us at BAR Gallery for a presentation of the Latymer Mapping Project in the context of counter-mapping and community art projects. 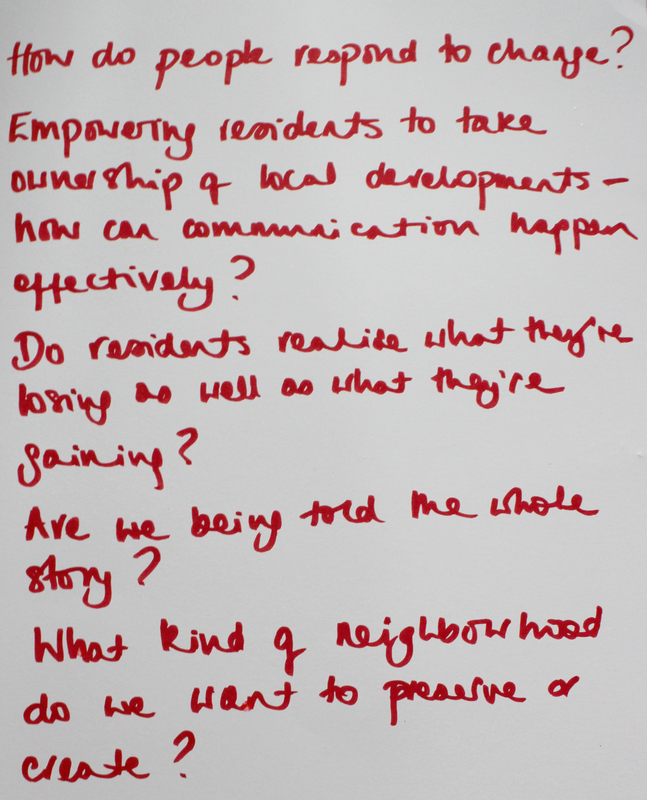 We will present our research, methodology and processes and share our experiences of running a community-focused project in North Kensington, as well as reflecting on the response from local residents to the final map. 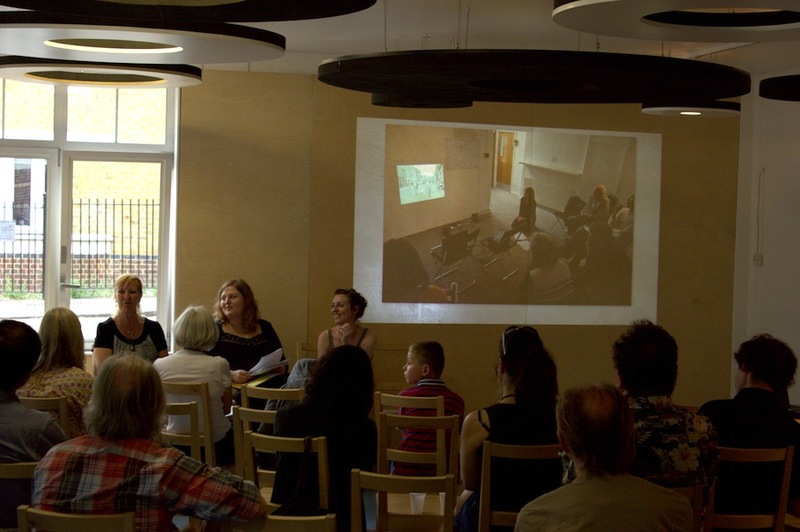 This is a great opportunity to discuss in depth the various issues surrounding community engagement and participation, the artist’s role and responsibilities in the process of urban regeneration and useful strategies for working with local residents, organisations and community representatives. For further information please visit BAR Gallery’s website. 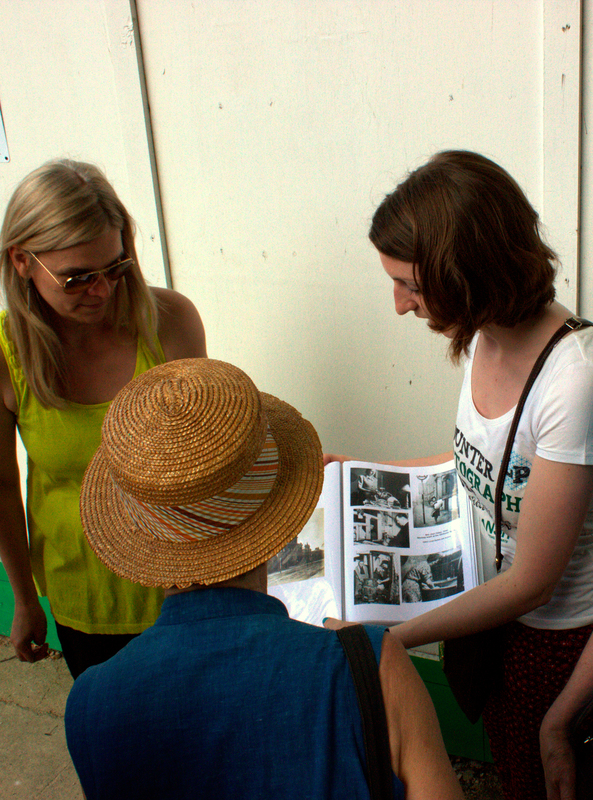 Photos from our July Counter Cartography Tours! 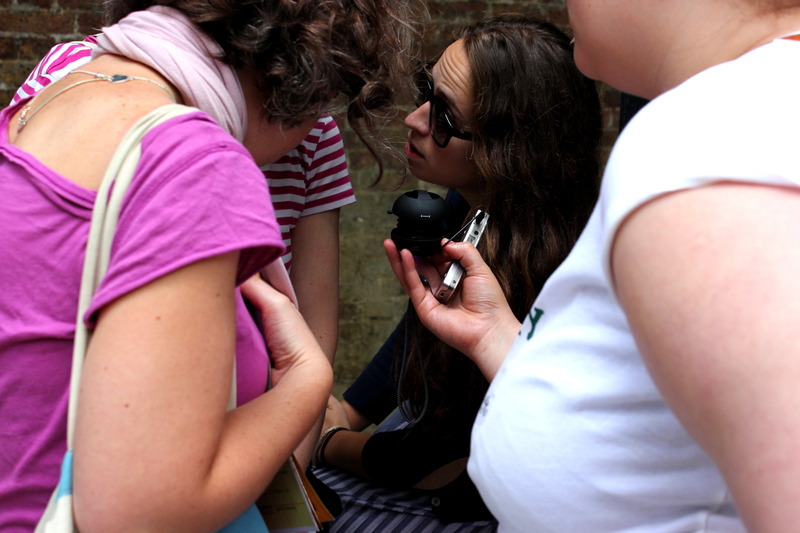 We had a great time running our counter cartography tours for InTRANSIT Festival this last week. 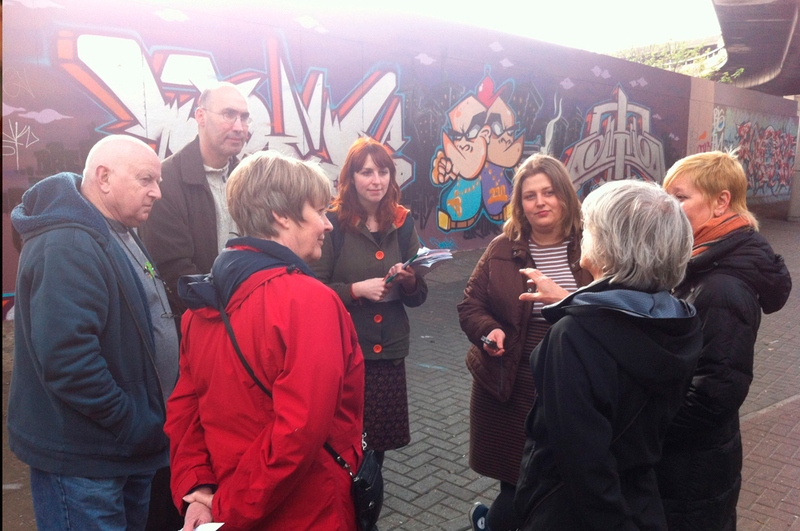 We have walked with a mixture of people very new to the area and those who have lived here for a long time, making for an interesting group learning experience, picking up some new facts about the area as well as informing and updating each other on new bits of news. Our route covered only a very small area starting at Latimer Road tube station, weaving through the Lancaster West Estate up to the former site of squatting community Frestonia, onto the nicknamed “Monsoon Village” and then North up Freston Road via the Silchester West estate and finishing up under the Westway elevated roundabout. Even on this fairly small circuit it proved difficult to squeeze in the vast rich histories (and futures) of the area and we found ourselves careering off on various tangents..shame we couldn’t spend all day on the walk! Thanks to everyone who came along and endured the hot weather, it was a great experience for us and we hope you all continue to enjoy the map. Thanks again to the RBKC InTRANSIT Fund for making this possible! 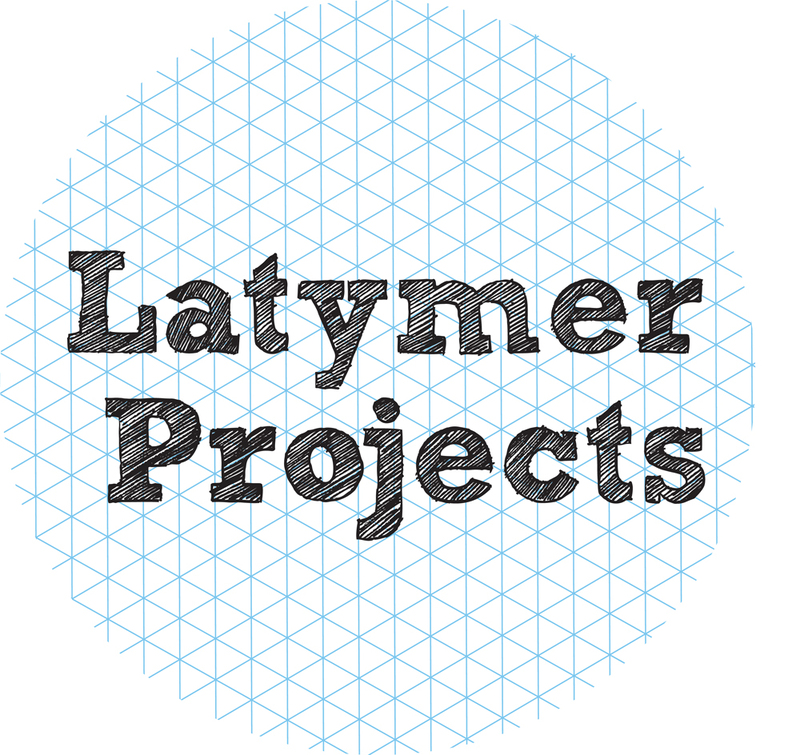 The Latymer Map is Launched! 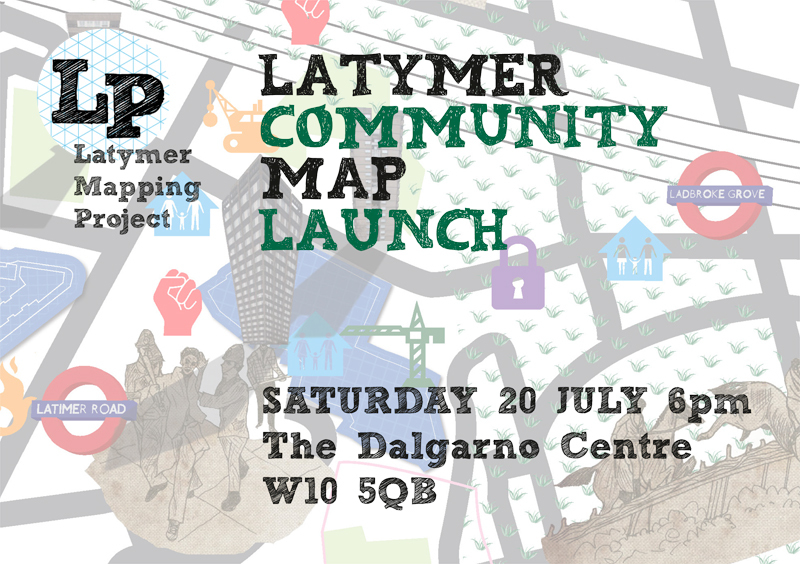 The Latymer Map was launched on Saturday 20th July at the Dalgarno Community Centre. Thank you to everyone who came along, it was a brilliant evening, interesting passionate discussion and great to see both familiar and new faces! Keep in touch by subscribing to this blog and to the group+work mailing list (info[at]group-work.org) and send us your feedback of the map and your experience of using it in the area! 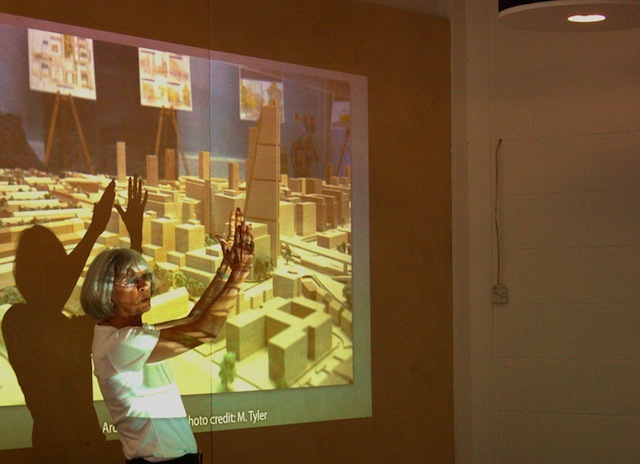 Counter Cartography Tours at InTRANSIT Festival this July! 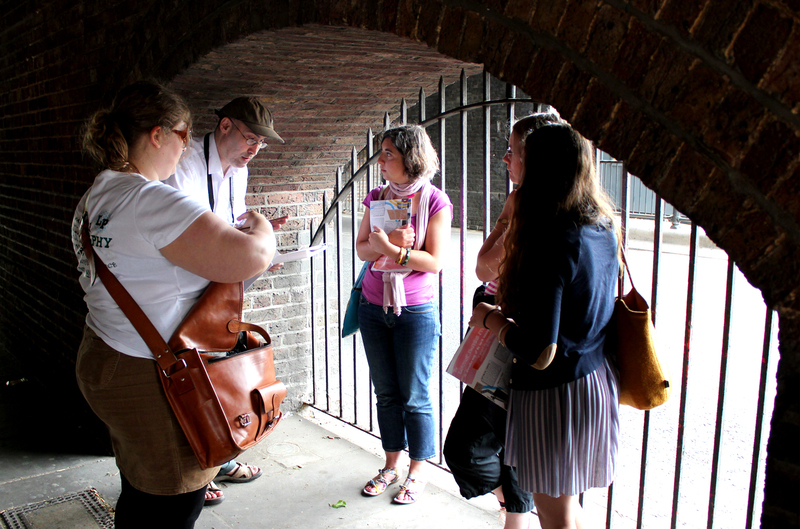 The Latymer Mapping Project will be running two guided tours in the Notting Barns ward of North Kensington this July, as part of RBKC’s open air festival InTRANSIT. 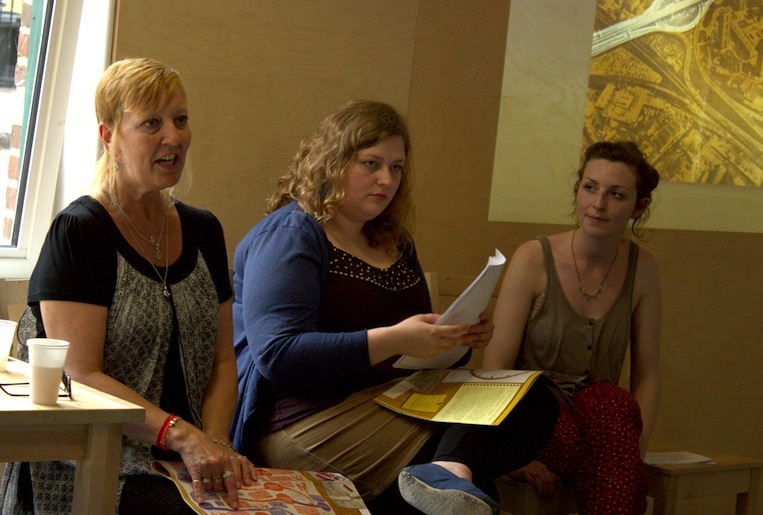 Armed with our maps, we will explore issues and stories in the area relating to regeneration, housing, social issues, and a selection of cultural facts and personal anecdotes. 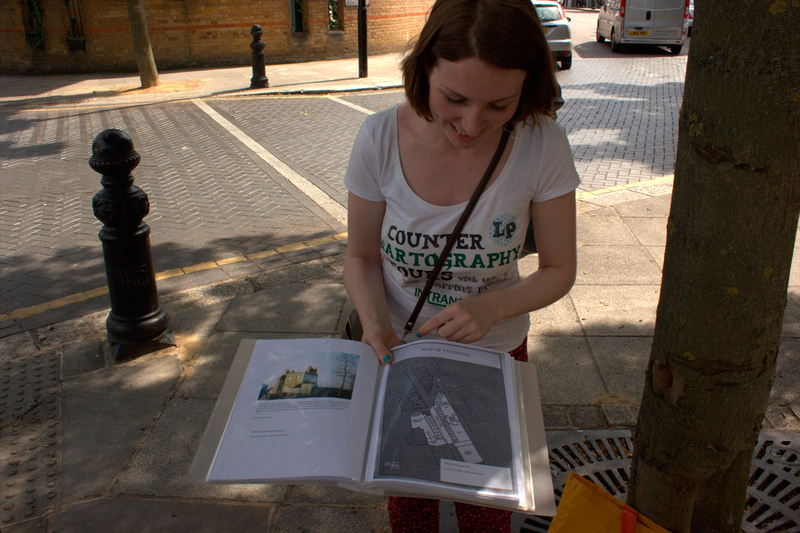 InTRANSIT was first launched in 2007 when the programme took the form of artist-led walking tours around the borough. The Festival has since evolved to work with emerging and established artists from Britain and abroad to bring the streets and outdoor spaces of Kensington and Chelsea alive for a week each summer. 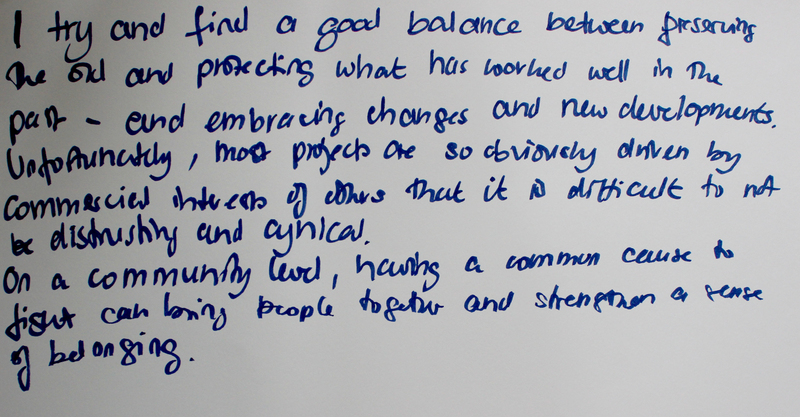 For further information about InTRANSIT and to view the programme click here. The Latymer Map is Ready for Take-off! After a year of research in the North Kensington area and a series of workshops with the local community, the moment has now arrived to share the Latymer Map! Doors are open from 6pm and the discussion will start at approximately 6.30. RSVP on our Facebook event page here. Armed with a camera, some thick clothing and our mapping workshop notes we spent 2 hours visiting some of the sites that were discussed in those sessions almost a year ago. We made our way from the Silchester Estate, heading South to visit the “Monsoon Village” of clean glassy facades and walkways lined with CCTV cameras, around the Frestonia housing co-op and Bramley Road, back up North-East through the 1970s brutalist architecture of Lancaster West Estate and Grenfell Tower, overlooking the new North Kensington Leisure Centre and Academy developments, and finishing our walk along the underside of the infamous Westway. 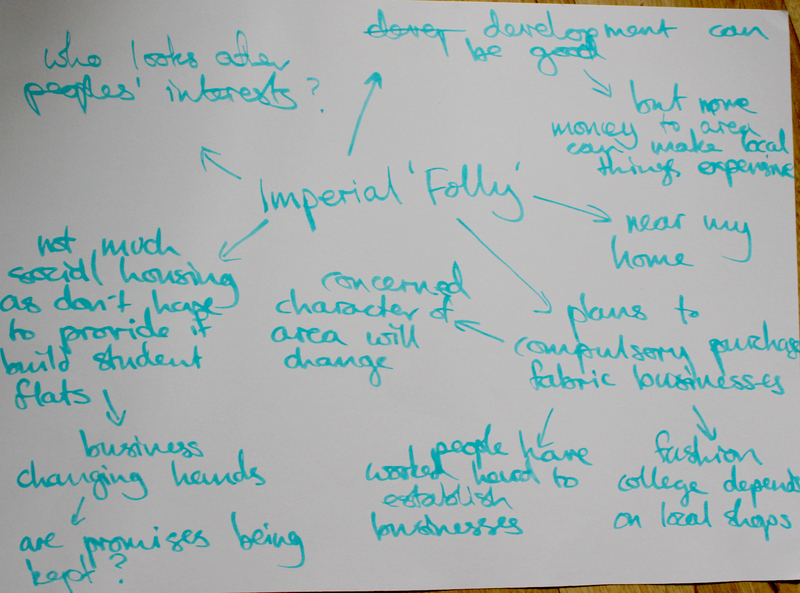 Read on for some of our observations. The former Latymer Family Centre where Latymer Projects was housed remains as we left it. The garages, marked up as being the first to fall for construction, were also left untouched. This came as no surprise to us, but our sense of disappointment was palpable: to think of the progress we made in that short time, and to imagine the possibilities had we been able to continue using the space between September 2012 and now. 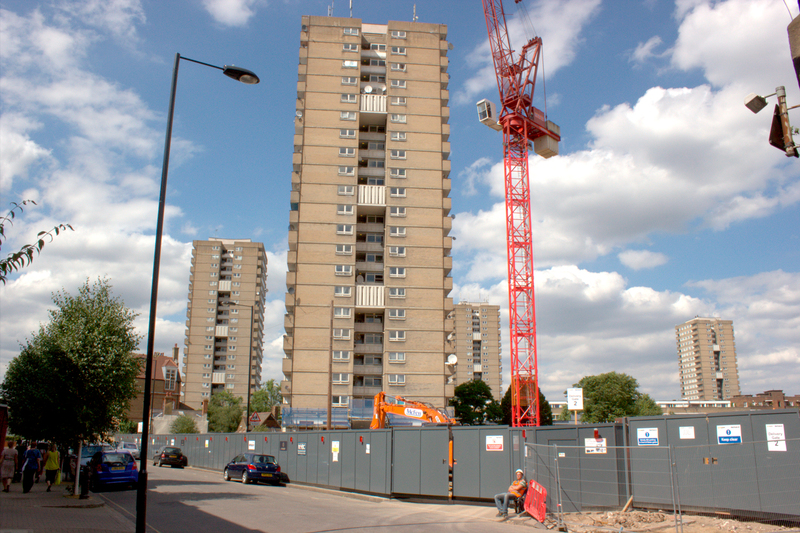 Looking on the RBKC web pages for the Silchester redevelopment plans, there doesn’t seem to be any indication that plans are behind schedule – demolition is noted as due in March 2013 and residents were recently invited to meet the contractors Mace on 13th February. 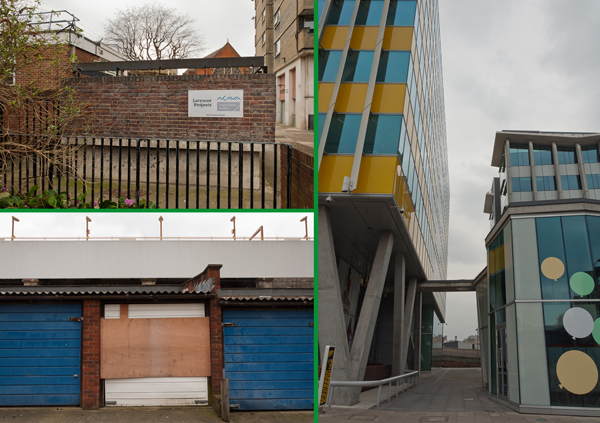 It’s strange to think that during our time at the space, rumours abounded that the demolition of the centre and the garages could begin as early as March 2012 – indeed, that is supposed to be why the lease on the family centre had a 6 month break clause, and we could be asked to vacate with just a few weeks notice. 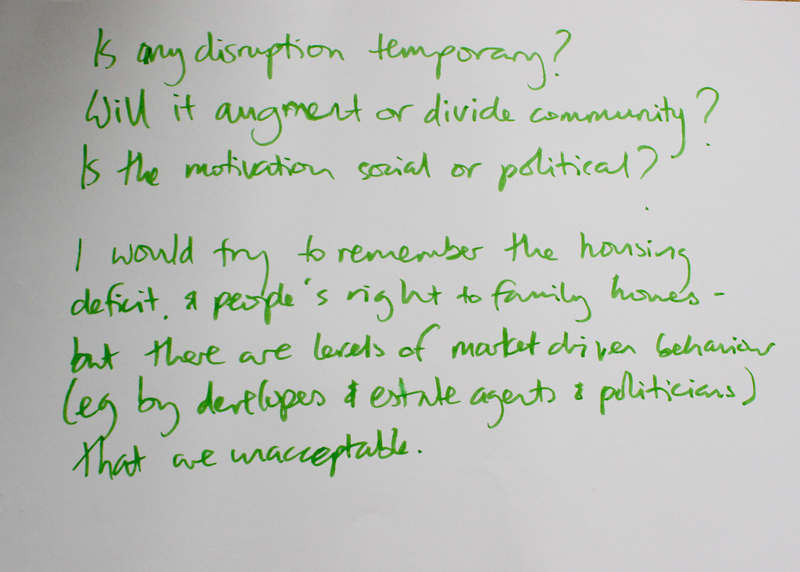 This continual uncertainty of whether the centre would be demolished made our time at the space, along with the studio artists’ tenancies, very precarious. 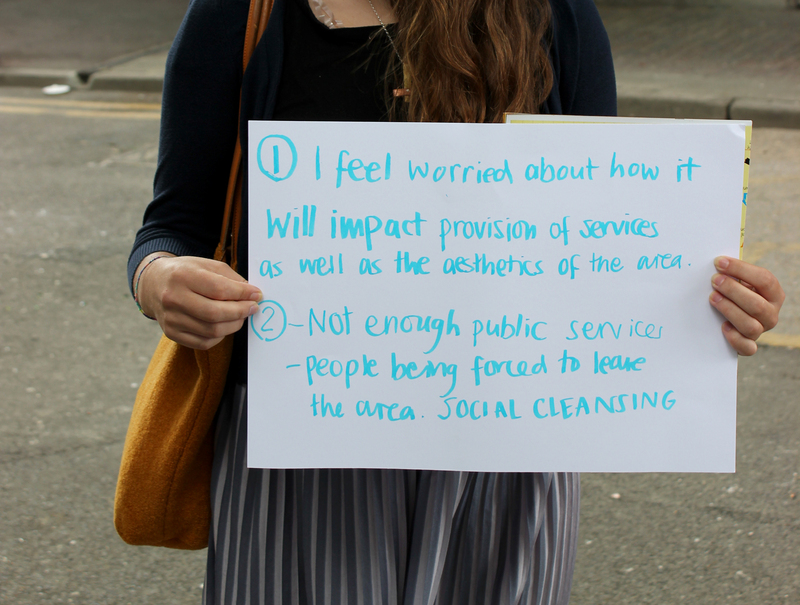 However, we imagine that this sense of disappointment is felt far more acutely for those residents that have been disrupted for the redevelopment. 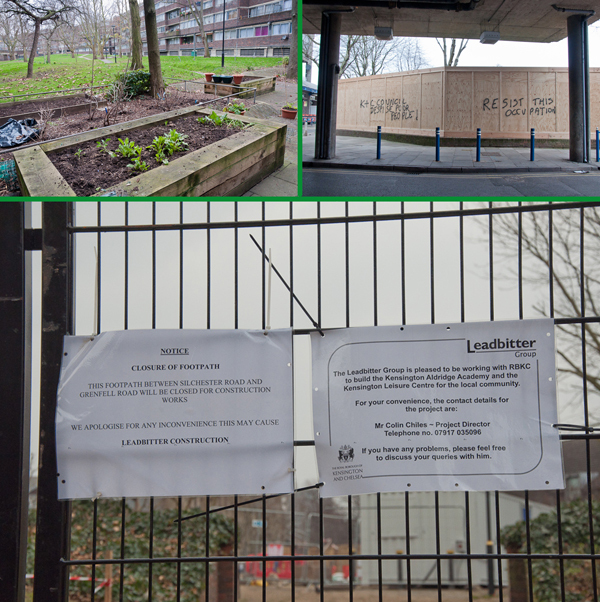 We decided to walk through the Lancaster West Estate, which, like many estates of its kind built in the 1970s, are large enclosures with various walkways connecting separate block-like sections. The Heygate Estate in Elephant & Castle is perhaps the most notorious structure of this type in London; one of the starkest examples of post-war urban decay, the Heygate is now being demolished to make way for the developer-led gentrification of the area, following long and embittered battles between tenants, activists and the local council (see Southwark Notes to follow this). Initially intended as a functional and low-cost solution for the construction of government buildings and social housing in the aftermath of World War II, Brutalism as a style is characterised by repetitive angular geometries, an honesty towards materials and a rough, blocky appearance. As an architectural philosophy, the movement is closely associated with socialist utopian ideology; for the architects and planners, these estates were human-oriented, socially progressive visions of the city, which sought to serve its citizens and foster a sense of community and civic responsibility. Critiques of the movement are numerous, not least because of failure of that vision and the association of “the estate” with crime and social deprivation. 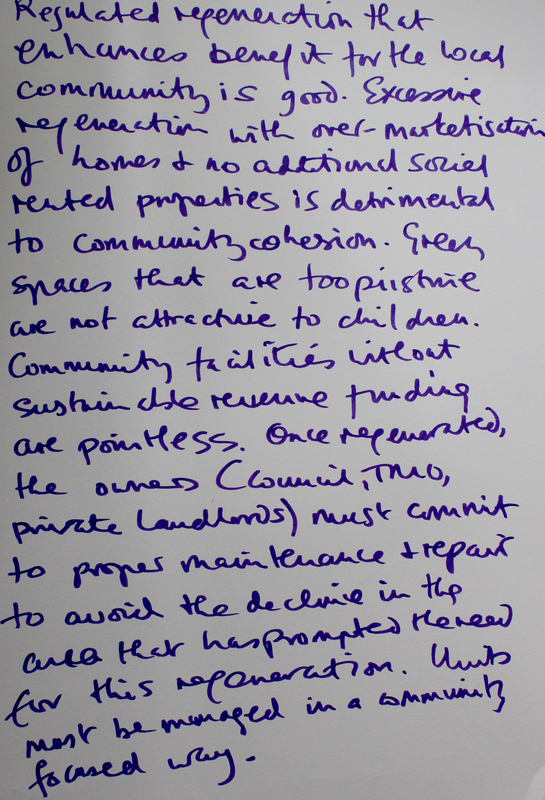 In most cases, these projects have also been subject to neglect and decay, which should also be attributed to lack of care and withdrawal of funding by local government and management authorities, and not the sole result of anti-social or irresponsible behaviour on the part of a small number of tenants. 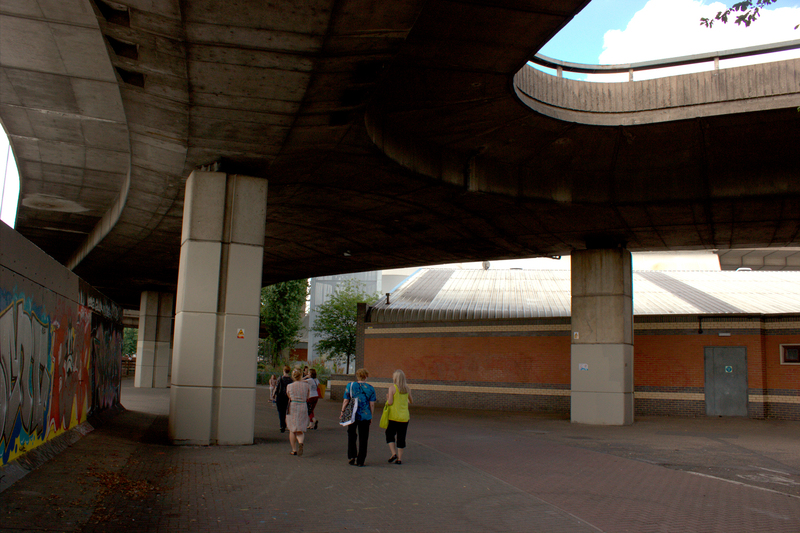 The Lancaster estate itself was visually impressive, and the walkways even echo the Westway flyover itself. While the estate did not seem dangerous or deprived, neither did it have a particularly social atmosphere, but perhaps that can be blamed on the cold weather! There was certainly some gestures towards communal living, in the form of benches, some sizeable grassy areas and large planters. 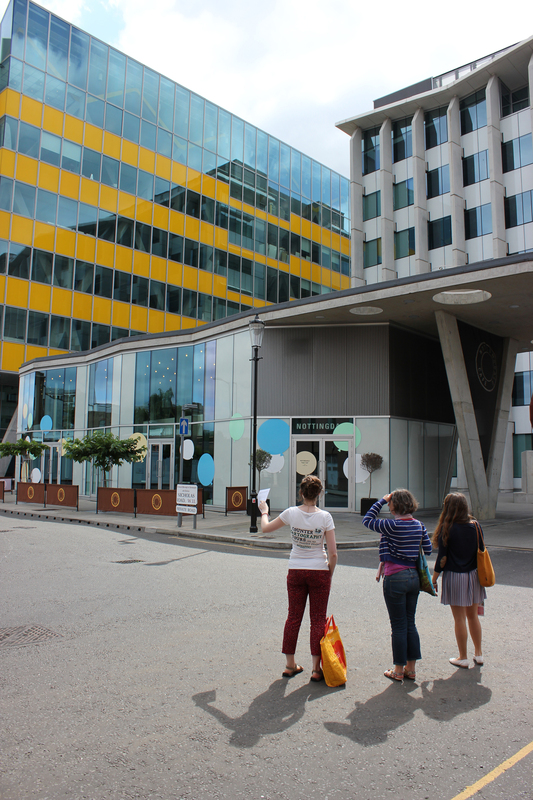 We walked back on ourselves and took a route around the estate heading towards the Grenfell Tower block, which looks over the construction site of the upcoming academy and leisure centre. Pictured above is a wall mural by Grenfell Tower, featuring a cast of colourful characters and aspirational slogans. If anyone has further information on this mural, please get in touch: we’re very interested to know who commissioned this, who the artists were, and if any schools or local residents were involved. We’d also like to know your opinions on the mural: do you think it improves or detracts from the landscape? 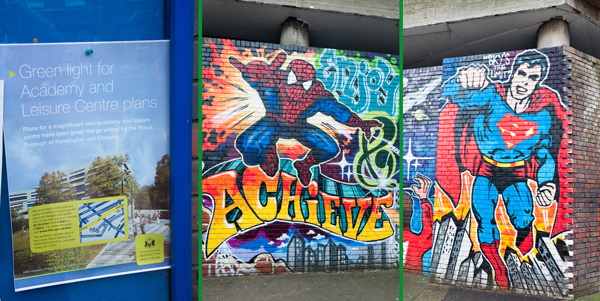 We now know a little more about the mural thanks to some local knowledge – the mural was promoted by the Lancaster West Estate Management Board as a regenerative project for local children to get involved with. Young people from the Rugby Portobello Project created the mural though sadly only one actually lived on the Estate itself, with the others coming from other parts of North Kensington. The mural is based on principles that the Rugby Portobello Project are said to observe such as respect for one another, to look out for your peers, not to bully, etc. 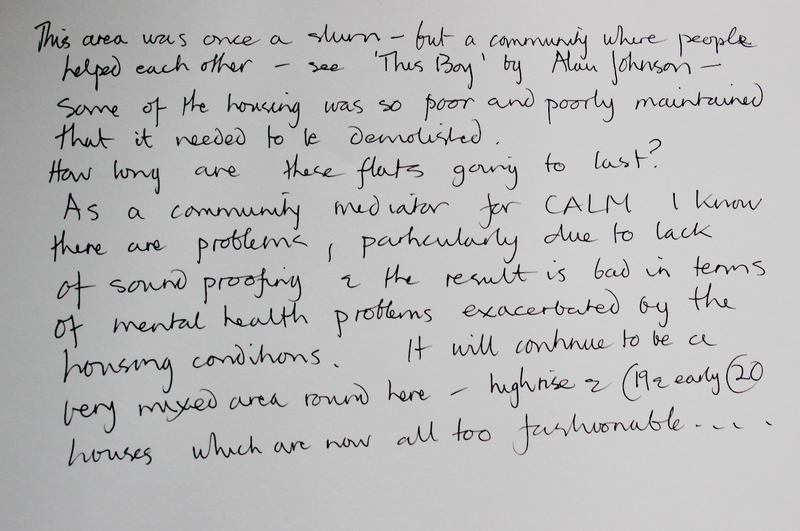 Some residents really like it, others loathe it. Apparently there were plans to do another mural opposite this one but this hasn’t come to anything as yet, owing to the Kensington Academy and Leisure Centre project. The mural was opened by the then Mayor of the borough, Cllr. Tim Coleridge and Cllr. Judith Blakeman. We would still like to hear your thoughts about it! 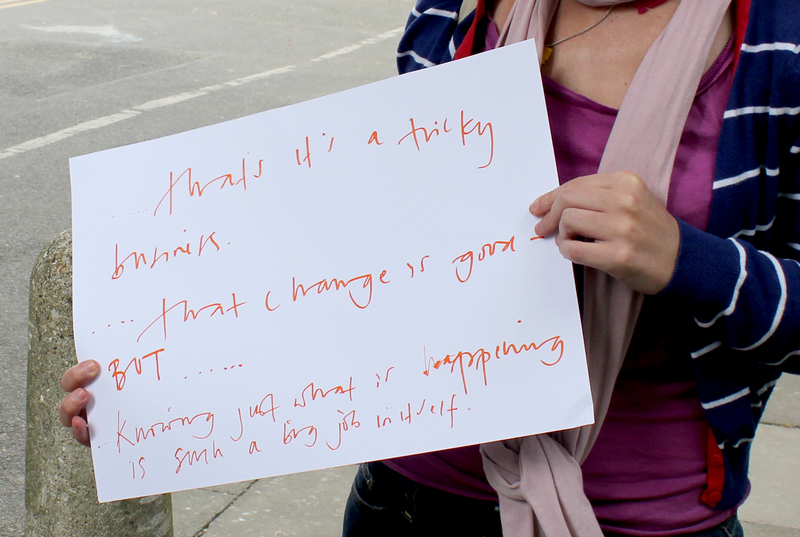 Do you find the messages hopeful or patronising? 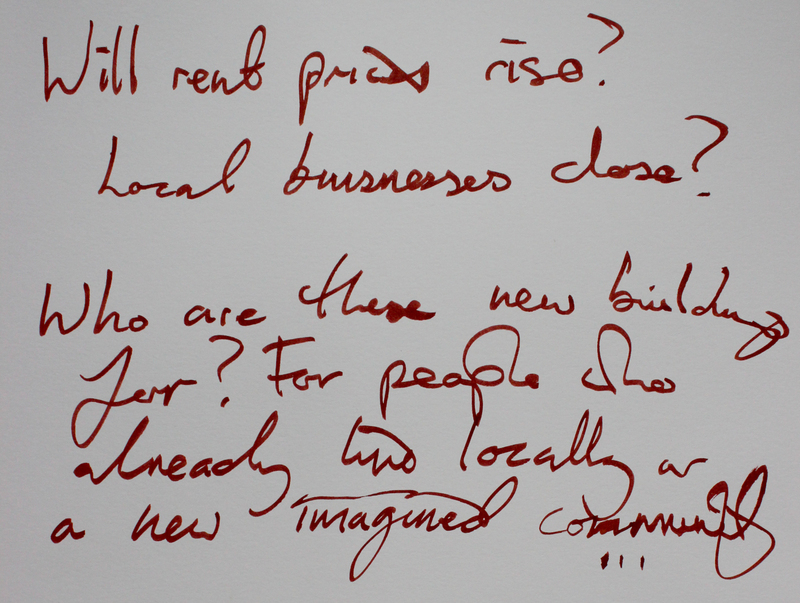 Do you think this work reflects the interests and opinions of local residents, or does it just represent other people’s ideas about community? 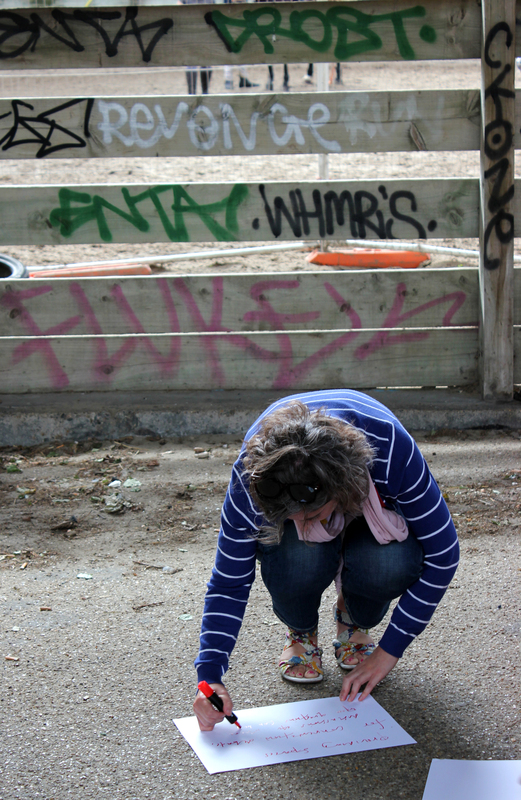 Do you think the works of artists in the area improves relations and brings the community together, or do you feel these commissions try to make up for shortcomings in public provision elsewhere? 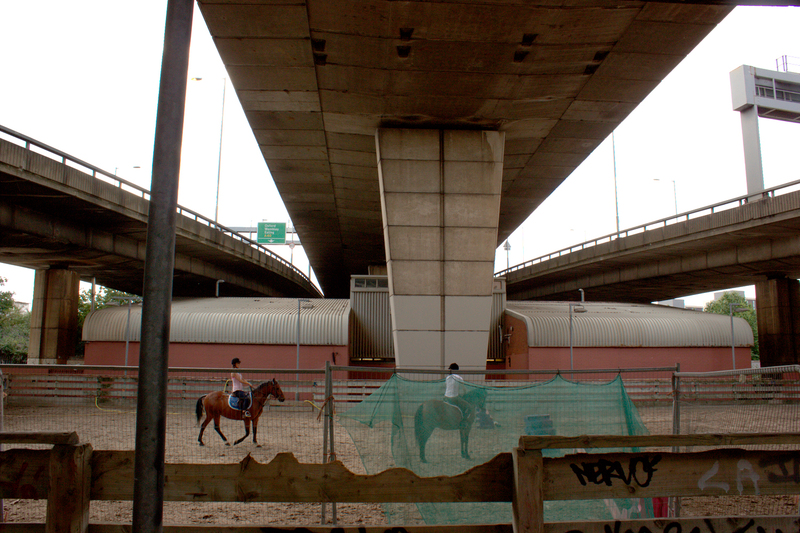 Walking along the underside of the Westway, we wondered about the future of the spaces beneath the flyover. 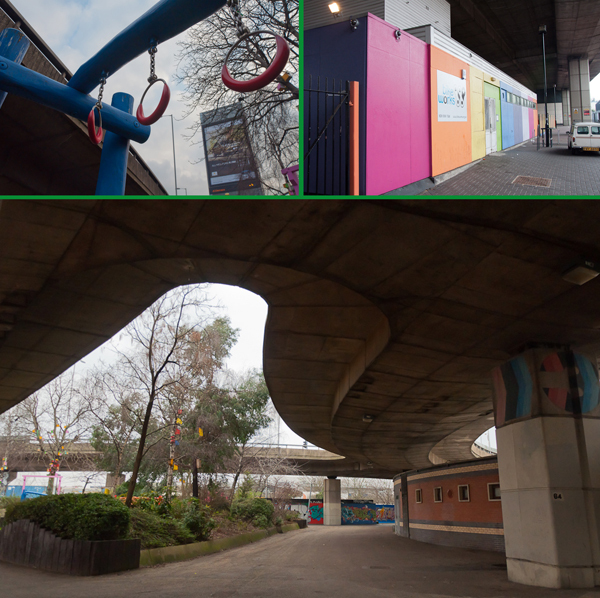 The Westway Development Trust recently put out a call to local people, community groups and businesses to make proposals for these spaces, with the intention of turning the underside of the Westway into a community hub. The proposed development would be a mixture of community-focused spaces and private-sector designated units. 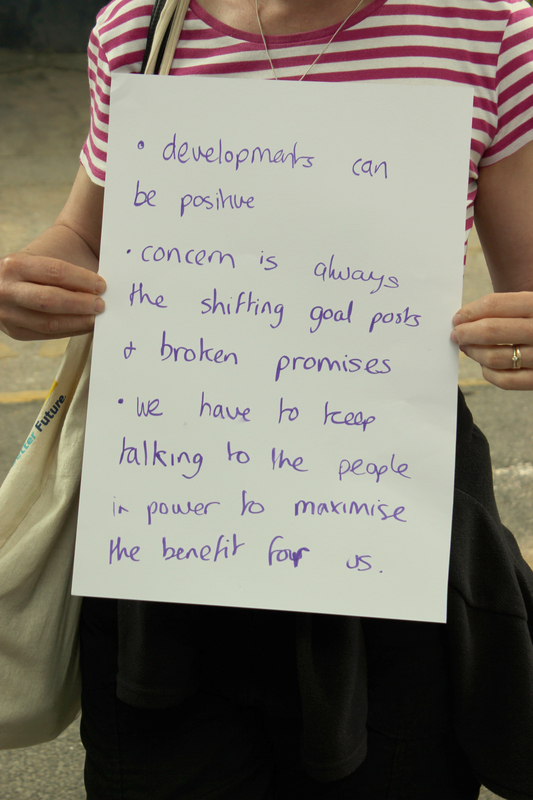 Our hopes are that the successful proposals will be responsive and sensitive to local needs. 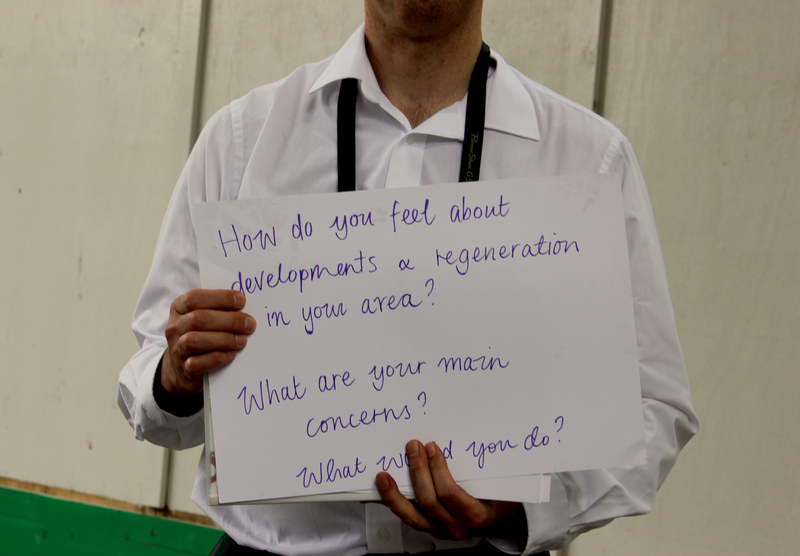 We’ll be heading over to see the Westway Development Trust’s exhibition of plans at 6 Thorpe Close, London W10 5XL, where you can leave your feedback and responses to proposed plans.